Yeah, you guys know I'm not really a gaming person but my family is and Winning Moves sent me some samples of some of their games in order to facilitate a few reviews. I have received no other compensation for these posts and all opinions I share here are entirely my own least you ever begin to doubt it! Curious about the history of the Cube, (go on . . . roll your eyes), I looked it up. This puzzle was created by a Hungarian named Erno Rubik. The creation of the puzzle came out rather as an accident. He wanted to piece together some blocks and figure out how they could move independently of one another without falling apart. He build a cube and then painted each side a different color and began shifting them about as many of us do. Then he asked himself how hard it would be to work the colors back to the starting position with each side matching. It took him a month to solve this puzzle, but he did it! Rubik applied for a patent in 1975 and, thus, the Rubik Cube was born and exists to frustrate millions today! (Woo hoo!) 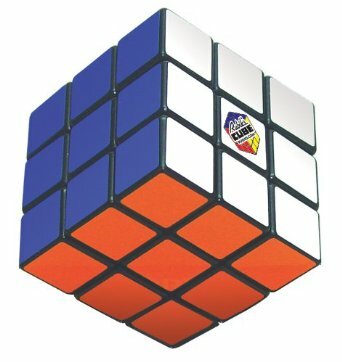 Although Rubik applied for a patent in 1975, the "Magic Cube" (as it was first called) didn't really take off until a mathematician got a hold of it and asked Rubik for permission to sell it in the west. Rubik became a millionaire. As the Rubik Cube is something of a brainy puzzle, I like the idea of having some around the house for my kids to fiddle with and fiddle they do. (As I said, my six year old has gotten as far as having one side match.) Both of my boys randomly pick up their Cubes and see how far they can get in solving this mathematical riddle. 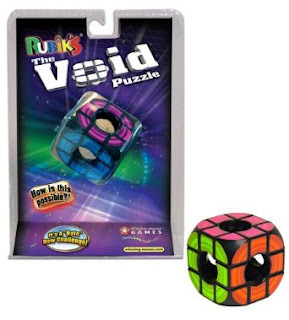 Winning Moves has also produced a variation on the Rubik, offering The Void Puzzle . My husband said that the puzzle would be impossibly hard to solve. My brother-in-law gave it a crack and managed to solve it. However, he said that his being able to solve it was a complete accident and a mystery to himself because the hole in the middle provides no point of reference. I was surprised to hear that there is a point of reference anywhere on the cube! (Heh.) That to say, it can be solved but it is much harder. If you are looking for a challenge then look no further. My kids think it looks awesome and so they continue with their fiddling. Many thanks to Winning Moves for sending samples of the above two items our direction in exchange for our honest thoughts. I have never been able to solve one of those, either. I've never had the patience to solve the cube, although I know the basic theory. BTW, the centers are important because they stay the same while everything else moves. So, presumably, one must either remember where the centers are and keep them stable, or find a new method of keeping track for this one. I found your history more interesting than the cube itself. I too have only successfully done one side.